As you've probably surmised, I have a thing for hats (and shoes and the list goes on...). 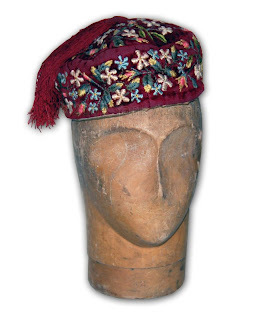 This week at the Sunday Antique Market, I'll have this wonderful Victorian smoking cap: silk lined, embroidered velvet with a silk tassel. It's in good condition but there is some loss to the plush of the velvet. It's a (dare I say it? Why not?) a hair small on me which would probably make it a size 7. They're becoming very hard to find in wearable shape. Smoking caps and jackets were, of course, used to prevent the stench of tobacco smoke from migrating to one's clothing and hair. Very sensible indeed. Do you sell this smoking hat?